Sweat to sweet success unfolds 4 years of dedicated work on climate-proofing of rice in drought, flooded, salty, and upland soils-enabling the rice crop to be productive amidst adverse weather and soil conditions. Read through and learn about the importance of stress-tolerant rice varieties to farmers and where CURE comes in. New rice varieties are now available to shield farmers from environmental stressors. Be it drought or flooding or salinity, each is a stressor to both the rice crop and the farmers. Consequently, rice production is significantly reduced. Farmers’ households cope with the reduced yield by not eating rice for some meals or days; husbands get out of their communities to find alternative jobs, and children quit school. Management options/rice-based cropping systems have been established. In addition to varietal development, CURE-NARES scientists also worked on management options that would enable improved stress-tolerant rice varieties to perform at their best. Management guidelines for nursery, pre-flood, and post-flood conditions. Management options for salinity-prone areas. Fertilizer application in rainfed salt-affected coastal areas is often not feasible; hence, fertilizer application in the nursery is very important. Further, raising seedlings in non-saline fields and using them along with soil from the seedbed for transplanting are practiced in certain areas to cope with salt stress. Better management of blast in the uplands. Mulching with plant residues, crop rotation, along with other conservation agriculture technologies (Vietnam). Crop combinations that can be grown with rice for drought (Nepal and Philippines). The cultivation of short-/long-duration leguminous crops in combination with upland rice not only reduces the risk of crop failure but also improves soil fertility. Growing Ghaiya-1 with two crop combinations, 1) rice + groundnut and 2) rice + maize, under farmer-managed conditions in the uplands in Bail of Bajhang district has been validated by farmers and proven beneficial. The two crops (maize and groundnut) can escape from latent drought and farmers can minimize the risk of failure of the rice crop due to drought. Farmers liked these two crop combinations. Upland rice-based cropping sequences: upland rice-chickpea and upland rice-pigeon pea (India) and rice-mungbean (Philippines). Nutrient Manager for Rice (NMR) is a tool for optimally managing fertilizer application for high grain yield and profitability in rainfed lowlands. Farmers from barangays San Jacinto and Cabuluan, Victoria, Tarlac validated and adopted the use of NMR. Local government units, farmers, and farmer-leaders participated in planning and conducting the field evaluation. The experiment mainly focused on the effect of the NM recommendation and the NM +PK recommendation in comparison with farmers’ practice. The NM recommendation not only produced higher yield in most cases but also resulted in lower fertilizer cost compared with farmers’ practice. Increased access to rice technologies is given to farmers. Studies show that farmers in remote areas find it difficult to obtain farm inputs, new technologies, and knowledge about agriculture-based technologies. To bridge this technology access gap, CURE and NARES partners have set up some enabling mechanisms. A major component needed to influence adoption of new improved stress-tolerant rice varieties is the seed factor. CURE and NARES staff simultaneously produce and distribute seeds during field trials managed by either a researcher or a farmer. In between these field trials, farmer-to-farmer access to seeds and exchange of seeds with other farmers happen. Seeds are informally distributed in this manner. This shortens the dynamics of distribution and consequently swells into community-wide adoption. The journey of a seed needs to be shortened to fast-track delivery to farmers. With CURE interventions, before a variety’s certification and official release, farmers are able to test, validate their preference, and provide feedback. This, in a way, has given farmers an opportunity to access seeds even prior to official release. What happens in this context is that, aside from several iterations of on-station trials by researchers, farmers among themselves also carry out their own on-farm trials side-byside with their traditional local and popular varieties. Four mechanisms function as main avenues through which farmers draw technologies: use of participatory varietal selection (PVS)/demonstration trials, minikit/seed packet distribution, community-based seed system (CBSS), and training. Informal training falls under the PVS mechanism (e.g., cross visits where farmers are able to see technology demonstration sites, exchange of ideas and seeds). PVS. This involves an initial round of researcher-managed on-farm “mother trials,” from which farmers choose their preferred materials, which are often evaluated in farmer-managed “baby trials” to give farmers actual experience in testing new germplasm. In both trials, visiting farmers vote their preferences. There is a follow-up group discussion to generate their criteria for selection. PVS activities leading toward rice varietal release, validation, and adoption have been done in the 10 partner countries. Volume of seeds distributed. Minikits or seed packets were distributed to direct farmer-cooperators or partners. Each minikit contains packets of seeds of a specific weight, which may range from 1 to 5 kg, depending on the country or location of origin. About 4,504 minikits have been distributed to farmers in 4 years. The total seed volume was 1,997 tons. This volume includes seeds distributed through various activities (minikits/seed packet distribution, PVS, demonstration/yield trials, seed exchanges during seed fairs, etc.). CBSS. Farmers usually share seeds among themselves. The CBSS involves individual storage and seed exchange and the more formal and elaborate seed exchanges and seed networks that have greater geographical reach. Seeds stored on farm are a primary form of in situ preservation of genetic resources. Usually, farmers group themselves and formally register as a seed cooperative to sell seeds. In Nepal alone, a total of 51.8 tons of seeds were released to farmers from 2009 to 2013. In particular, the IFAD-supported project completed in 2009, Managing Rice Landscapes in the Marginal Uplands for Household Food Security and Environmental Sustainability, paved the way in forming CBSS in Nepal. CURE continues this initiative. Today, it has facilitated the formation of well-functioning seed producer groups. package of introduced/improved varieties and crop management practices (including crop diversification systems). 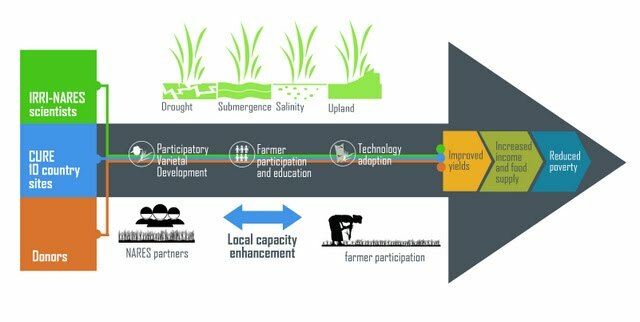 19,953 farmers (for activities with gender-disaggregated data: 60% male and 40% female) were trained on various topics related to improved rice technologies and management across the four ecosystems. 3,060 researchers and scientists (59% male, 41% female) were trained on various technologies, social science aspects, gender and development, varietal development, validation, and extension strategies. CURE gives importance to the participation of women in networking arrangements with respect to activities on germplasm development, testing and release of varieties, validation of natural resource management (NRM) practices, as well as, in adaptive research that would bring technologies and information to a greater number of farmers and in capacity-building for NARES and partners. In the Philippines, CURE is a member of the IFAD Philippines Gender Network (IPGN). The country network serves as an avenue for sharing, exchanging experiences, identifying partners, and other activities. The presence of the network not only strengthens gender knowledge and strategies but also serves as an avenue for grants and investment projects to identify potential areas and activities for partnerships. CURE and IRRI programs on gender have been sharing expertise and experience in examining gender issues in rice farming in fragile areas. With enriched learning and additional guidance from the IPGN, CURE crafted its framework/guidelines for gender mainstreaming (as an internal guide) for two projects, TAG 1108 and TAG 1227.
training programs, particularly on seed health management, CBSS, application of technologies, and livelihood options through rice-based farming and livestock production. 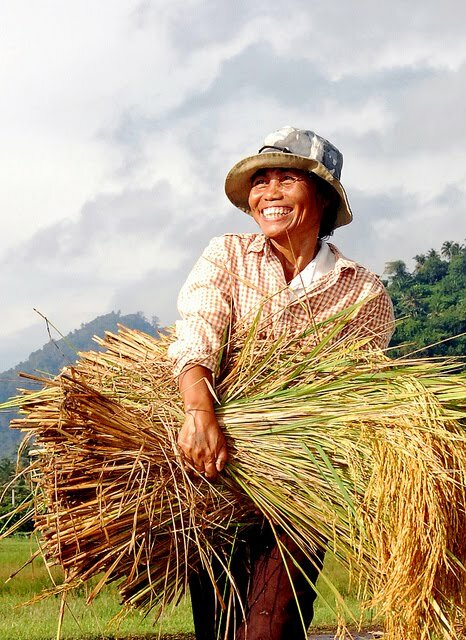 In context, IFAD supports CURE through a grant (#1108-IRRI) that would implement the project entitled, Enabling the Poor Rice Farmers to Improve Livelihoods and Overcome Poverty in South and Southeast Asia through the Consortium for Unfavorable Rice Environments (CURE). This grant was approved by the IFAD Board in April 2009. This project began on 28 July 2009 and had a completion target date of 31 March 2013. Ten countries partnered with CURE in implementing this project: Bangladesh, Cambodia, Lao PDR, India, Indonesia, Myanmar, Nepal, Philippines, Thailand, and Vietnam. Figure 2 describes the process flow of CURE activities from varietal development to technology adoption. enhance capacity of NARES and local communities and IFAD-supported investment projects to effectively plan and use development initiatives, access information and innovations, and adapt and deliver products through partnerships.